Baker's Dozen: A Batch of 4th of July Links! Linking up early for the holiday weekend--enjoy, sweeties! 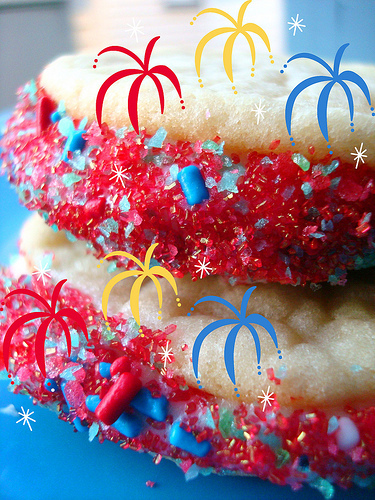 Still a fave: pop rocks cookies that taste like fireworks! Cake that looks like the American flag! Cool! Patriotic rose cake. Red white and yum! Hot dog cookies! Adorable and not savory, but sweet! Red white and blue pinwheel cookies! America the Sweet: Hartford Election Day Cake from United Cakes of America. Totally sweet trompe l'oeil: hot dog and hamburger style! Why can't I be eating it right now: pop rocks pound cake! A nice cool-down: watermelon pudding. Love these red white and blue cupcakes! Homemade berry rocket pops. Yum! A roundup I did of cakes for cookouts on Craftsy should also serve as great inspiration!